In the past decade some incredible breakthroughs and discoveries have been made which could completely change the types of medical solutions we will use in the future. The 1.2 million people suffering from the pain of Fibromyalgia in the UK could experience complete remission just by eliminating two artificial additives from their diet? 73% of eczema sufferers made a full recovery just from taking a simple but often over-looked supplement? Horseradish root has been found to be as effective as antibiotics in treating certain conditions? Regular use of ibuprofen and aspirin could double your risk of heart failure, breast cancer and peptic ulcers? Why should you suffer when alternatives exist that could offer you total remission or longed for relief from pain? Got a specific condition that you just can’t seem to clear? A suffering spouse? Parents in pain? This just might be the book that helps you find the solution for good . . . If you or those you know suffer from any form of pain, this new book, ‘PAIN-FREE FOREVER’ could help find the miracle you’ve been praying for. Click here to order your copy now and save £5.00 on the normal price. 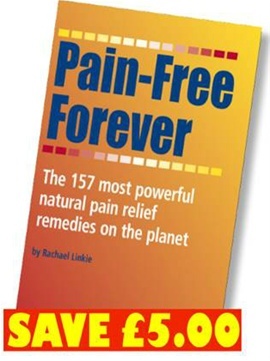 In the pages of this incredible and long-awaited book you will find a full section of specific advice for almost every condition that causes pain and suffering. But what about the latest pain relief methods in general? What pills will you be popping in ten years time (or now if you read this book today) in place of your Nurofen Plus or CoCodamol? Whenever you suffer from a pain or a condition that you’ve been living with for years, it’s often hard to believe that a cure could be possible. Indeed, your doctors have probably told you many times over already that this is just something that you’re always going to have to live with. But what if you were like the lady you’ll read about on page 17 who had suffered unbearable pain in her back and hip for as long as she could remember - but then experienced complete relief by taking a supplement made from the bark of a tree? And this is what this new book - 'PAIN-FREE FOREVER' - is all about. It is about bringing you the cures that will be transforming lives in the future into YOUR living room and YOUR LIFE today. Whatever conditions you suffer from - even if it’s just recurrent headaches or a nagging back - this book could do so much to educate you about pain and help you eradicate it and its causes from your life. It could also enable you to help and heal so many of the people you love around you who are suffering so much more than they need to.